For a couple years at university I was doing research trying to put together the relationship between weather in the lower atmopshere (troposphere) and solar/cosmic rays from space. How does the sun effect our weather? I remember comming across research experiments in Antarctica with cool names like IceCube. Through consistent info mining, seminars, and tours of research facilities at McMurdo I've so far come across the projects: IceCube, ANITA, CREAM, and Firefly. It would take a thesis or two for me to put all my thoughts together on these experiments and concepts, and it would be so much easier for me to just give you the info directly: http://www.nsf.gov/news/news_summ.jsp?cntn_id=112591&org=OLPA&from=news, which I will do at times. But, many of us don't have the time or desire to dig through a bunch of scholarly articles or websites. It all starts with the sun. http://pwg.gsfc.nasa.gov/istp/outreach/cmeposter/. Without the suns outbursts of energy (http://www.sec.noaa.gov/), as measured with satellites (or historically, sunspot counts - Galileo) the Earth would not obtain sufficient energy from the rest of the cosmos to create a greenhouse that allows life to survive. It takes energy to make energy, and all the energy we embrace on Earth basically comes from the sun. We know the sun creates light and a sun tan, that's energy comming from the infrared (warmth), visual (light), and ultraviolet spectrum (sunburn). The sun also spits out coronal mass ejections (CMEs) which are waves of high energy radiation, i.e. Gamma. 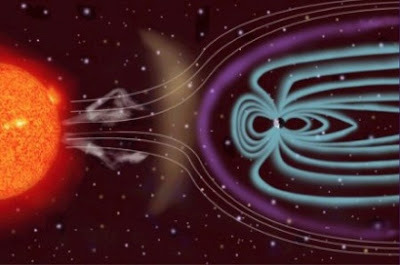 Some of these CMEs hit the Earth's magnetosphere, creating geomagnetic storms. Most people think of storms as events with lightning and thunder. Well, geomagnetic storms are quite different, they spark light shows like the auroras and alter communications, sometimes electrical grids. I remember hearing of small black outs in Canada and satellite shut downs durring the end of the last solar maximum when we had an x-29 flare that created a >10 Kp event. I was looking at www.spaceweather.com in my dorm room during first year of Uni (bored of course) and saw the solar data peaking... ran outside and saw the most crazy natural light show on Earth. Xabier (from the Carribean) and I laid in the snow hypnotized by the dancing auroras. The first thing the waves of radiation hit is the ionosphere and the ionosphere has very little mass/molecules compared to the other spheres or atmosphere layers below it. You may just find hydrogen and helium way up there. All the storms most folks are aware of are the storms that occur in the troposphere where majority of the clouds and water vapour exist. Geomagnetic storms start in the ionosphere and impact the lower layers via a trickle down, or should I say resonating particle shower (?) effect. When the solar energy particles hit the particles in the ionosphere they get excited and shed their electrons. The auroras (northern/southern lights) come from the excited electrons smacking into each other. The high energy particles comming from the sun are downgraded as they make their way through the ionosphere. They collide with Earth molecules (i.e. Helium) and create several visible electrons in the visual spectrum via ionization. Different molecules = different colours. The story doesn't stop there. Given the high altitude view point from satellite observations, scientists began to notice streaks, balls, and 'sprites' of bright coloured lights way above lightning storms. All this has become 'evidenced' in only the last several decades with technology. Farmers in the 1800s were trying to correlate sunspots with crop fertility by just counting sun spots and observing how their crops fare. Auroras have also dazed Arctic aboriginals living in the Arctic for millenia. Thus the only difference from the past is that we have the technology to get a view point from space to see new features/events associated with the solar and cosmic particles colliding with the Earth. Scientists are nowadays are also working in labs or particle accelerators, creating their own particle shower. They are also sending solar/cosmic ray detectors way up in the atmosphere via balloons/satellites or way below the ice with drilling operations. Through balloon and satellite solar particle observations we've learned many things. The ionosphere is positively charged, and it's charge depends on the level of energy of the particles being ionized, stripped of electrons. In simple termss, as the sun spits more energy at us the ionosphere gets more charged. Now the Earth is negatively charged. What happens when you rub your feet on carpet and touch a door knob... negative + a positive = a shock. In the Earth's case... it's a strike of lightning. Lightning discharges the energy built up from both the Sun and Earth. Positive = ionosphere. Negative = Earth. In between those polarities are auroras, elves, sprites, beads, tendrils, gnomes, megalightning, and the simple regular lightning that are aware of. Futhermore in between those polarities are also plants, animals, humans, brains, electrical grids, satellites. Very little research has been done to understand the effect that the Earth's electric circuit has on the simple things in life. Can I start it? Or should I say, can I pick it back up from where the 19th century farmers and Tesla left off? What scientists are currently heading towards is finding how in fact solar or cosmic particles can lead to lightning in the troposphere. It seems very logical, but one has to take apart the entire atmosphere with quantum physics in mind to truly get a grip on what's going on. So what about IceCube, ANITA, CREAM, and Firefly. Well the first three experiments have to do more with the search for the mysterious Neutrino. IceCube is Neutrino dector buried deep within the ice, and ANITA and CREAM are long distance balloon projects in search of Neutrinos, and/or the effects of. Firefly is a relatively new experiment looking to piece together solar energy particles and lighting storms. There's a lot to the sun-earth relationship that we don't know about it, but maybe we once knew about it and are just piecing our memories back together. Most of the cosmic science take places once began as an idea, or theory. Some of Einstein's and Tesla's theoretical work eventually led to the H.A.A.R.P. facility in Alaska toying with the plasma densities to see what the effects are on climate. My fascination with this cosmic connection is rooted in my spirituallity and personal philosophies. I've always viewed the sun as a creator that gives us warmth and light so that we may enjoy the power of love. My tattoos potray it, and my tattoos are based on Eskimo, Inuit, Hindu, and Egyptian beliefs about the sun as a creator, and destroyer. Christianity correlates the creator with love and blinding light. It's all the same darn thing and I think we are all just talking about the sun or some other cosmic event/force that produced us. Could be chaos. Or maybe we are all talking about the big bang (whooping supernova) that created all of this matter/energy we embrace... that's where the Neutrinos come in ;) So in search of Neutrinos and how the Earth is connected with the sun and universe we are really just in search of a Creator, and you can go really high up above ground or really low underground to find that.